In honor of Halloween season, I thought it appropriate to round up a list of ten haunted libraries here in the United States. And if you know of any other good library ghost stories, please leave them in the comments! Providing library services since 1885, Willard Library is the oldest public library in Indiana. This historic library, housed in a Victorian Gothic building is reportedly haunted by the ghost of The Grey Lady. The library has been investigated by several paranormal organizations and they have ghost cams set up throughout the library so that at-home ghost hunters can see if they can spot The Grey Lady. More coverage here. The home of this Arkansas library from 1967 to 2003 was a converted theater building – The Old Palace Theater. Librarians began to suspect that the building was haunted after hearing phantom footsteps, seeing paperback carousels rotating by themselves, as well as books falling from the shelves. This public library is said to have been cursed in 1847 by Mary Stevenson Gray (or Grey), who previously owned the land where the library now stands. The curse is rumored to have caused the untimely deaths of three library directors in the early 20th century who now haunt the library. More coverage here. The Arabian and Civic Center branches of the Scottsdale (AZ) Public Library have been investigated by professional ghost hunters Sonoran Paranormal Investigations and have been found to be haunted. The investigation was done at the Library’s request after many reports of books and other objects moving by themselves, cold spots in the library and more. More coverage here. This school library in Alhambra, CA was founded in 1889 and is one of the oldest operating schools in the state. A nun in a white habit has been seen by students roaming around the library. Ghostly music can be heard in the Julia Ideson Building of the Houston Public Library. It it said to be the ghost of Julius Frank Cramer, a night janitor who practiced playing a violin in through the library after it was closed. He lived in a basement apartment in the building until he died in 1936. More coverage here. This private library in Fauquier County, Virginia is said to be haunted by the ghost of Civil War Col. William Chapman. His presence has been reported to make loud noises during the night and lock doors within the 1790 house. More coverage here. This college library at Monmouth University was originally built in 1905 as the summer home of mining and smelting entrepreneur Murry Guggenheim. It is said that a lady in white walks down the staircase at midnight when the library closes. More coverage here. A dark-haired woman in the basement and a whistling ghost, and a ghostly man wearing jeans and work boots on the second floor are just some of the haunts of the Parmly Billings Library. Acquisitions Librarian Karen Stevens wrote a book about these and other hauntings titled Haunted Montana. More coverage here. The Phoenixville Public Library in Pennsylvania is haunted by three different ghosts that inhabit the recently renovated 1902 building. One is described by the library’s Executive Director John Kelleyas a lady wearing a bustle dress who haunts the attic. 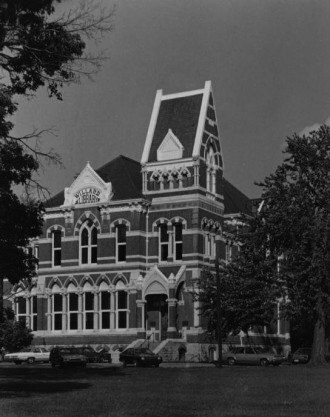 The library was investigated in 2006 by the Chester County Paranormal Research Society. More coverage here. Haunted Libraries in the Northeast, U.S. Haunted Libraries in the Midwest, U.S. Haunted Libraries in the South, U.S. Haunted Libraries in the West, U.S.